Donegal ETB has published a three-year strategic agreement for its Further Education and Training (FET) Service setting out its priority areas for the coming years which will see it substantially expand the traineeship model over the three year period, focus on upskilling of the existing workforce, build on its approach to enterprise engagement by targeting employers on a sectoral basis and integrate transversal skills development into all FET programmes. It demonstrates the commitment of Donegal ETB to ensuring FET provision that meets the needs of the local community, individual learners and businesses. 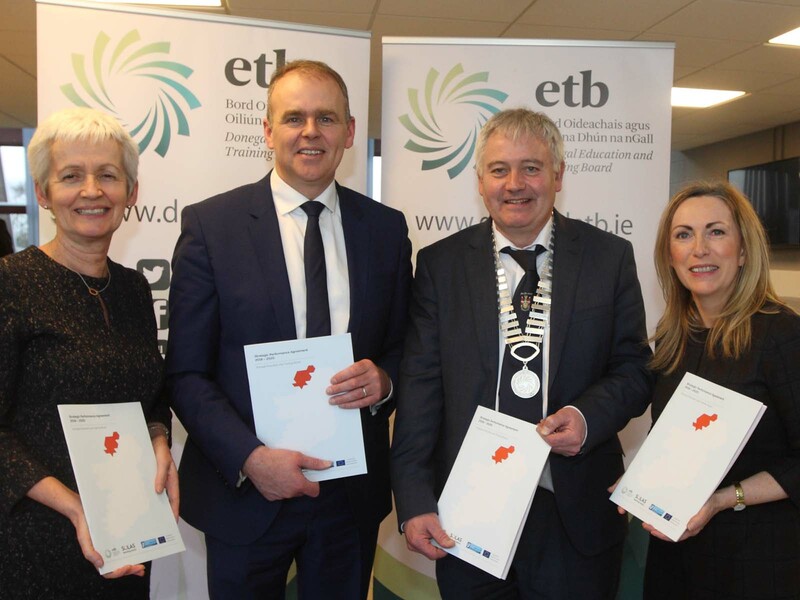 In launching the strategic agreement, Minister for Education and Skills, Joe McHugh, T.D., said, “Donegal ETB’s new, tailored strategies for further education and training in the county are a really significant step. ”They recognise the need to respond to a fast-changing world of work but also seizes on the new opportunities being created. “All those involved in the ETB have put a huge amount of thought and effort into this agreement, not least working with the Department of Education and Skills over the last year. Donegal ETB’s Strategic Performance Agreement 2018-2020 can be found here: https://www.donegaletb.ie/corporate/publications/ (Strategic Plans). Donegal ETB Director of Further Education and Training (FET) Cróna Gallagher, Minister for Education and Skills Joe McHugh T.D., Donegal ETB Chairperson Cllr Martin Harley, Donegal ETB Chief Executive Anne McHugh.